The CoffeeShop Blog: CoffeeShop Floral Business Card Template! CoffeeShop Floral Business Card Template! My sister Heather was designing some custom business cards today and I realized I didn't have any business card templates on my blog. So I went to work and had a great time designing this really pretty feminine two-sided business card. The two files are layered psd which can be edited in Photoshop or PSE. The two-sided card that comes in the download has the ivory and gold background, but you can change out the background, colors, and text very easily (as seen on the bottom sample in my ad with the rose background). The images are added via clipping masks. The beautiful images used in my ad are from Margaret Jackson Photography. I hope you enjoy my first business card! I plan on putting out more, they are really fun to design. 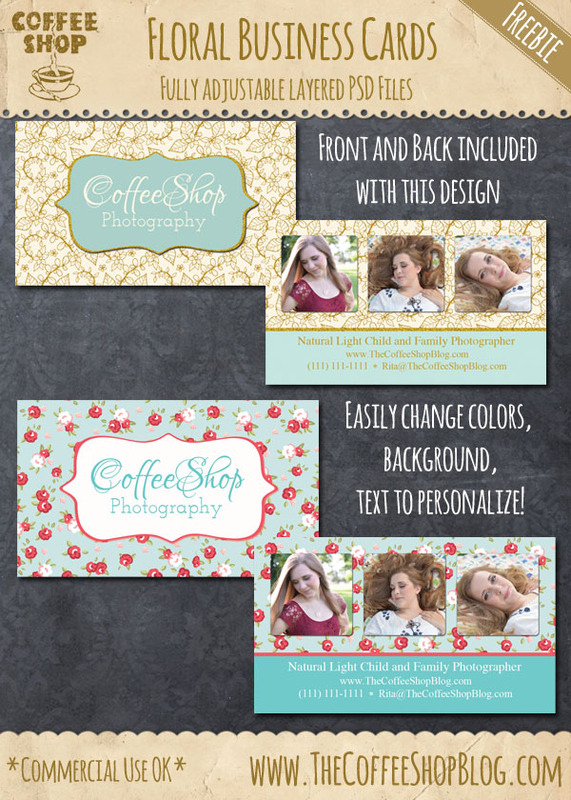 Download the CoffeeShop Floral Business Card. You can also download it here. please can you tell me where I can find the ivory and gold power/leaf digital paper you've used on this card? I am not sure. I added the gold trim to the paper myself, it was just colored. I think I purchased it years ago but I can't find it. I could make some similar paper for my blog if you want. Oh, Rita- please, PLEASE pretty Please!! !